A scene from the second act of “The Departure of Princess Kaguya” at Tokushima Cultural Center. An opera created by Hideaki Hirai, who is the artistic director, the composer and the conductor, based on the ancient Japanese story of “Princess Kaguya” will be performed in this summer during Nisei Week Festival, on Saturday, Aug. 22, at the Aratani Theatre, 244 S. San Pedro St. in Little Tokyo. Since its initial performance at Meguro Persimmon Hall in Tokyo in 2003, the opera has been performed more than 20 times worldwide, including Canberra, Australia in 2006; Prague, Czech Republic, in 2009; and Anif and Salzburg, Austria in 2012. 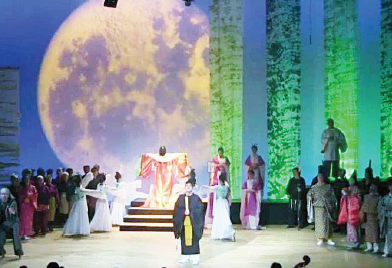 “Princess Kaguya” will be performed with four soloists from Japan — Takahashi Nobuko, Miura Katsuji, Tachibana Toshihiro, and Morota Hiromi — and choral groups and singers from the Los Angeles area. Rehearsals have already started but still there is still room for local singers and dancers to join. Contact Yasu Tanano at (310) 625-4222 if you are interested.